We started our August three week journey along the Gibb River Road in Broome. We hired a Land Cruiser and left Broome early for breakfast in Derby, a nice easy drive on sealed road of I think around 200 kms or a bit more. The bitumen ended once you turned off onto the Gibb River Road, about 63 kms in. It was 56 kms on unsealed road to the turn off into Windjana Gorge (20 kms in). We viewed that and had a walk around, beautiful and lots of crocs, from there we drove to Tunnel Creek, another 40 kms of very, very rough road. We then back-tracked over the ground covered to the Gibb River Road once again. It would have been possible to travel to this point along the Great Northern Highway and go into Tunnel Creek from there and onto Windjana Gorge and out onto the Gibb River Road, but sometimes that road is closed. From there we travelled another 100 kms or so onto Imintji Safari Camp run by ATP which is used by its tours but also anyone can stay there. We stayed two nights as by the time we got there we were pretty tired. The distances are vast. You can really only travel at about 60 kph or less depending on the ridges in the road. The next day we enjoyed our walk into Bell Gorge, again a couple of hours to get there. Our next stop was Mornington Wildlife Sanctuary. We left Imintji (where there is a roadhouse and a fuel stop) and drove an easy 25 kms to the turn off to Mornington. A mere 80 kms in but it took us two and three quarter hours to drive in! There are two gorges here, Dimond Gorge and Sir John Gorge. You can also hire canoes, no crowds and just so peaceful. We spent four days here and loved every minute of it. It takes a couple of hours to drive to each Gorge but you can swim in each of them and they are beautiful. Back on the Gibb Road, we refuelled at Mount Barnett Roadhouse. Another 90 kms on (a couple of hours) we took the turn off to Mt. Elizabeth Station - a working cattle station - 30 kms of very, very rough road. Our next stop was 150 kms down the road to Ellenbrae. Galvans Gorge was somewhere here - can't find my notes but don't miss it; a short walk in from the road and very pretty. From here we drove to Kununurra. We didn't have any mishaps with our vehicle although we saw lots who did. Apparently it's important to have low tyre pressure when travelling on these rough unforgiving roads (worth finding out about). No-one tells you anything and there isn't any information in the vehicles. I felt sorry for overseas visitors who haven't been advised of 1) tyre pressure and 2) speed. Look into it, talk to people, find out what your tyre pressure should be and what speed you should do. The camaraderie on the road is fantastic, everyone waves to on coming cars and people help one another. It was an amazing trip and one I'm proud I have done it. It's pure Australia and I loved it. I hope this is of some help. I found it hard to find information and it would be great if others could post their experiences. We also hired a gas car fridge in Broome, which was essential for that cold beer at the end of the day. Carol. PS. : I have only just found this website, six months after our trip. I think it's excellent. Thanks again, Carol! It's good to see that all my readers report the same thing: they dropped their tyre pressures and took it easy, and they didn't have any trouble. 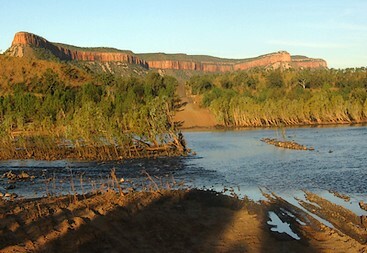 The "Need To Know" chapter in the main Gibb River Road section has info on that, and my Kimberley guide really emphasizes it, too. It even has a whole chapter on tyre pressures with specific numbers and recommendations. And it tells you where to hire that essential beer fridge! :-).